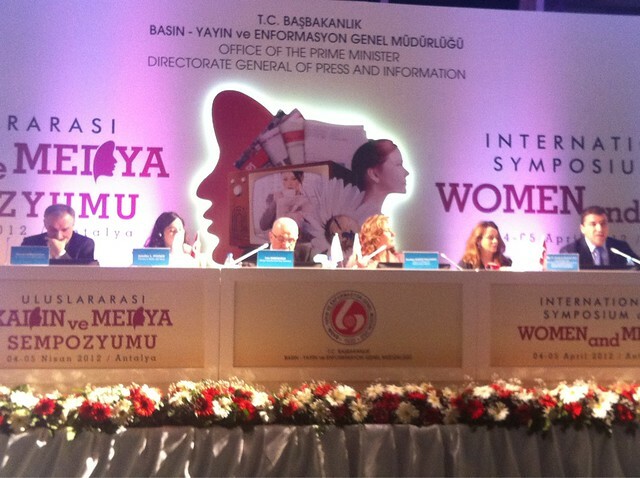 This two-day conference is bringing together Turkish Parlient leaders, politicians, media owners, newspaper editors-in-chief, broadcast journalists, human rights and women’s rights activists, as well as their counterparts from throughout the world, from the United Kingdom, Greece, the United States, among other regions. I will be joining this esteemed and powerful group of Turkish media and political leaders to speak about representations of women in U.S. media — from sexism in journalistic coverage of female politicians, to the marginalization of women as news sources, experts, producers and owners, to the way that reality TV has been functioning as backlash against women’s rights and social progress. And, finally, I will mention the positive ways women are using independent media (and increasingly accessible information communication technologies) to tell their own stories, from their own perspectives, on their own terms. UPDATE: The simultaneous translation into English from Turkish was somewhat problematic. I could tell there were many, many instances where words were missing or mistaken, or nuance was incorrectly translated, so it was hard for me to follow the comments of my fellow panelists — which is why I have not been liveblogging today. However, I am working with conference organizers to (hopefully) get video of the panels, at which point I will seek a Turkish volunteer to create a transcript. This entry was posted on Wednesday, April 4th, 2012 at 12:12 am	and is filed under Feminism, Human Rights & Civil Liberties, International Media, International Media Activism, Media Justice Now, Pop Culture, Race, Technology & Communication, WIMN’s Executive Director’s Blog. You can follow any responses to this entry through the RSS 2.0 feed. You can leave a response, or trackback from your own site.